Sean Timberlake. The Spruce Eats, 2014. Many preserving recipes, such as this small-batch pomegranate jam, call for fresh juice or seeds from a pomegranate. If you're unfamiliar with how to handle this fruit, here's a few tips on how to most efficiently open a pomegranate, extract the seeds, and get fresh-squeezed juice, no matter how you want to use them. First things first: Wear an apron. No matter how tidy you try to be, pomegranates will spray some juice, and it stains everything. With a sharp paring knife, trim away the top of the pomegranate just until you can see the seeds within. At the juncture where the membranes intersect the rind, use the knife to score the rind down to the bottom. Cut just deep enough to score the thick rind; do not cut into the fruit. 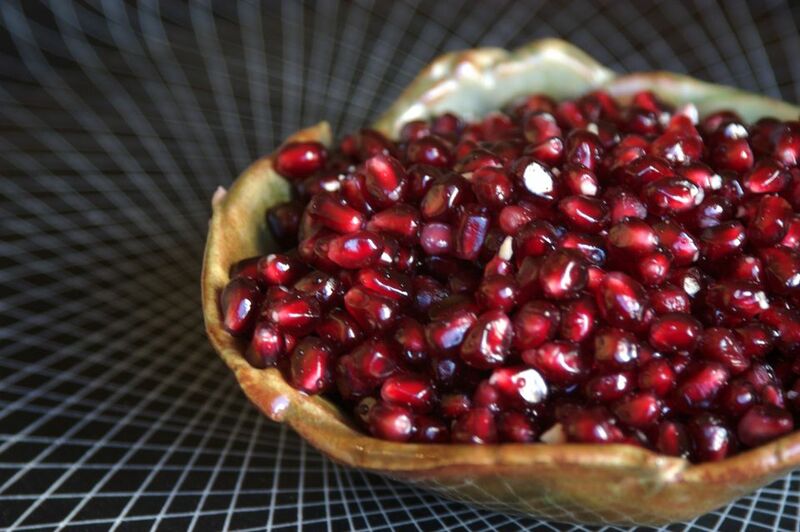 Once you've scored the pomegranate all around, gently pull it apart into segments. The fruit should open up quite easily, revealing the seeds in clusters. Fill a large bowl with water. Submerge each section, and gently rub the seeds with your thumbs to pry them loose from the rind. They should come away easily. Doing this in water serves two purposes: It reduces the amount of juice that will splatter around and makes separating the seeds easier. Once pried away, the heavier seeds will sink to the bottom of the bowl, and the rind and membranes will float to the top, so they can be easily skimmed away and discarded. The seeds may now be drained and used as desired. Some people recommend an alternative method, involving cutting the pomegranate in half, and slapping the backside of the rind with a wooden spoon. However, this method can be profoundly inefficient, and very messy. Once you have removed the seeds from your pomegranate, you can juice them by filling a large zip-top bag about 1/3 full, and then gently crushing them with a meat pounder, rolling pin, or another heavy item. Try not to crush the actual seeds too much, as they can impart a bitter flavor. If you want only the juice in the first place, you can also juice a pomegranate whole if it is very ripe and has no cracks in the rind. Simply roll the fruit firmly but gently under your palms on a hard surface like a countertop. Rotate the pomegranate, applying even pressure to all sides, until it is completely squishy and soft. You can then poke a hole in one side and squeeze the juice out. You should yield about 1/2 cup of juice per large, ripe pomegranate.